Coconut scent. 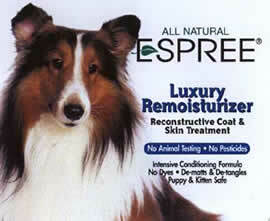 Remoisturizing treatment replenishes the skin with natural nutrients. 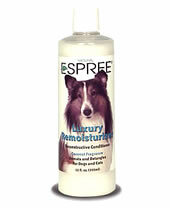 When used full strength it acts as a highly effective de-matter and de-tangler, leaving the coat soft and shiny. 1-gallon concentrate – dilutes with water, 32 to 1. This luxurious, easy to use hair reconstructor formula penetrates the hair shaft and revitalizes the skin and coat. May be used before or after shampooing to demat and detangle. Directions: Use full strength or dilute up to 32 parts warm water to 1 part conditioner and shake well. Massage into coat of dog or cat, leave in 3 minutes for best results and rinse thoroughly.